These flourless cookies are very low fat (not low calorie). If you use gluten free vanilla, then you can share these with friends who are not allowed to eat gluten. 3) Drop the soft, batter-like dough onto the prepared baking sheets in 1 1/2" circles; a tablespoon cookie scoop works well here. 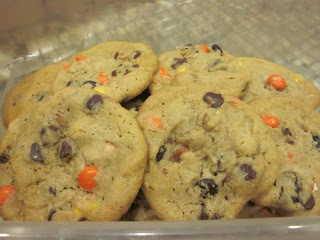 6) Yield: 16 large (3") cookies. Note: You can add up to 2 cups of chocolate chips to the recipe, but they will lose the "no fat" status. Increase cooking time by 2 minutes if you add the chips. Every year when it gets close to Thanksgiving, I start craving stuffing. 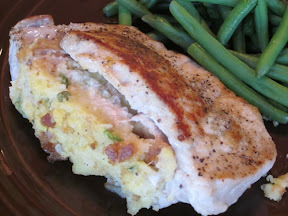 I decided to make some stuffed pork chops to help curb my craving until the holiday arrives. This simple recipe utilizes boxed stuffing (I'm not picky about stuffing - boxed stuffing works great to help satisfy a craving) to make a quick meal. Preheat the oven to 400 degrees. Prepare the stuffing per instructions. Slice pockets into the pork chops by slicing horizontally in the side, but be sure not to cut all the way through. Season the pork with garlic powder and pepper, then stuff with stuffing. Spray a large oven safe skillet with nonstick spray and turn heat to medium. Sear the pork chops on one side for 3-4 minutes until golden brown. Flip the chops and place the skillet in the oven for 9 minutes or until cooked through. Remove from the oven and let the meat rest for 3-5 minutes before serving. Heat oven to 400°F. 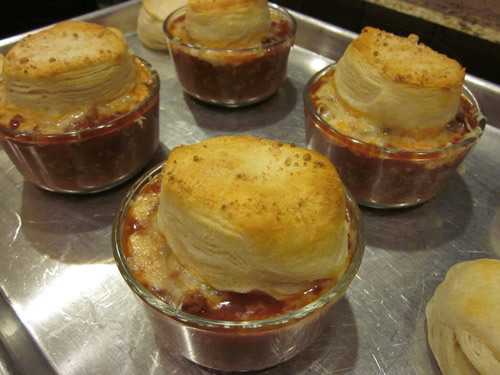 Grease two 10-oz custard cups or 12-oz (1 1/2-cup) casseroles. In 8-inch skillet, cook sausage and onion over medium-high heat 5 to 7 minutes, stirring frequently, until meat is thoroughly cooked; drain. Stir in pizza sauce and mushrooms; heat to boiling, stirring occasionally. Reduce heat; simmer uncovered 5 minutes, stirring occasionally. Spoon mixture into casseroles. Sprinkle 1 oz mozzarella cheese on each. Top each with uncooked biscuit; sprinkle with Parmesan cheese. Place custard cups on cookie sheet with sides. Bake 10-15 minutes until biscuits are browned. Another busy October week is on the books. ;) I got to spend the weekend being personal chef again for my mom, and we volunteered at Monett's community kitchen. What a great service offered in that town! The boys were busy with work, cross country and homework obligations. It will be nice next month when we will actually have some weekends together. I did get a chance to try my new cookie recipe. They were pretty good. 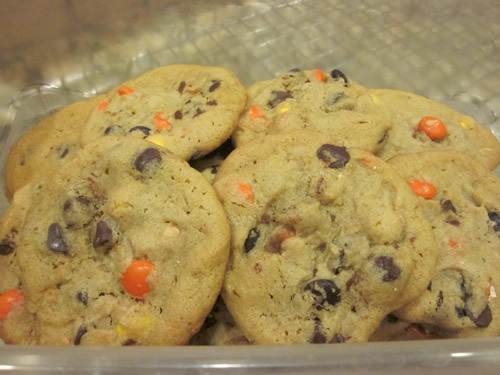 I had to modify the cooking time, and I didn't slice the cookies (I used my cookie scoop and then flattened them) like the recipe said, but they were definitely a tasty treat that I will make again.If you like peanut butter and chocolate, give these cookies a try. This week I'm using a new product in a couple of my meals. 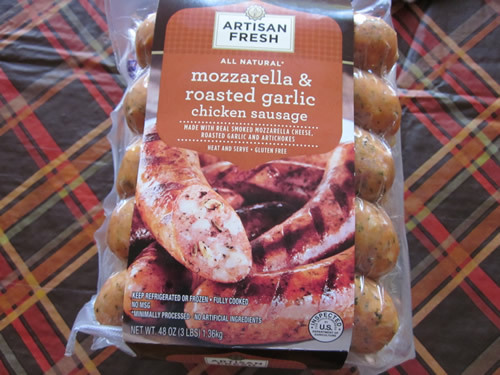 Last weekend I got suckered in by the free samples at Sam's club, and I bought some Artisan Fresh Mozzarella and Roasted Garlic Chicken Sausage. 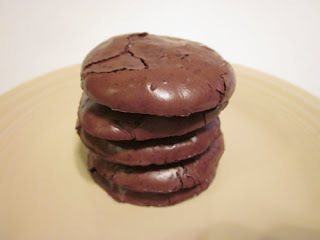 They tasted pretty darn good and are only 130 calories per link! We are grilling some tonight for sandwiches, and later in the week I'll be trying them in a new pasta dish. We have a couple of nights where it just won't be possible to eat at home, but at least they are for good activities (Corey's NHS induction and his MSA reunion). 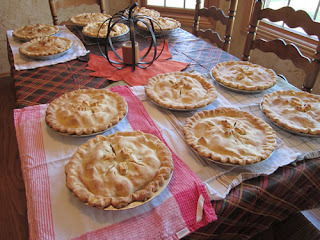 I'm a little late this year, but I finally had a day where I could do my annual apple pie baking. 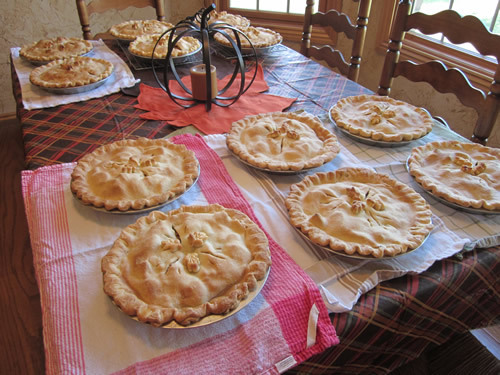 Each fall I bake up a bunch of apple pies to bring to my neighbors. It's a fun family tradition for us, and it's always nice to bring someone a treat that they are not expecting. This is a new recipe for me, and it recommends chilling the dough for at least 24 hours before baking. Once I made these, I did think the recipe directions needed a couple of changes. It recommends slicing the dough, which simple does not work because of the candy pieces. I used a cookie scoop like I would with regular chocolate chip cookies. They also took longer to bake than the recipe calls for. The next time I made them, I did not refrigerate them, and I increased the temperature to 375. They were very tasty cookies. 1. In a small mixing bowl, whisk together the flour, baking soda and salt. 2. With a stand mixer or large mixing bowl, beat together the butter, peanut butter, white sugar, brown sugar, vanilla and egg until it’s smooth. 3. Gently beat in the dry ingredients until the dough forms. Add in the chocolate chips and the candy-coated peanut butter candy. 4. Place a piece of wax or parchment paper on a clean surface and spoon the dough onto the middle of the paper. Form the dough into a long log and then fold the paper over the dough, wrapping it inside the paper. Let the wrapped dough sit in the refrigerator for at least 24 hours before slicing and baking. NOTE: I do not do this step when making these cookies. I just mix up the batter as directed, and then use a cookie scoop like I would for regular chocolate chip cookies. 5. To freeze the dough, let it sit in the fridge for 24 hours, then transfer it to the freezer. 6. To bake, preheat the oven to 350 degrees Fahrenheit and cut the dough into 1/4 inch circles. NOTE: I heat the oven to 375 degrees (and of course, as noted in step 4, I don't slice the dough, I scoop it). Bake in the preheated oven for 9 to 11 minutes. If baking from frozen dough, bake for 10 to 12 minutes. Cool the cookies on a cooling rack before serving. Another crazy week completed, and the next one is ready to begin.I feel like that's how I've started each of my blog posts lately. I guess that's the way of life, but business is much better than boredom. Luckily we've had some beautiful weekends that reinvigorate you after the work week. I spent the weekend with mom and got to be her personal chef. :) It's always nice to cook for someone who appreciates your food. The fall weather inspired me to try a couple of new recipes that turned out great. 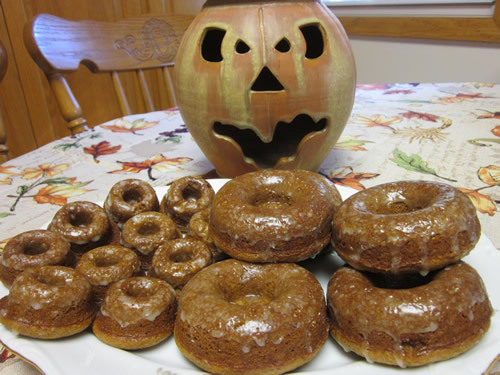 Be sure to check out my Apple Cider Donuts and Pumpkin Monkey Bread. Yum! What screams fall more than apples? Why, pumpkin! 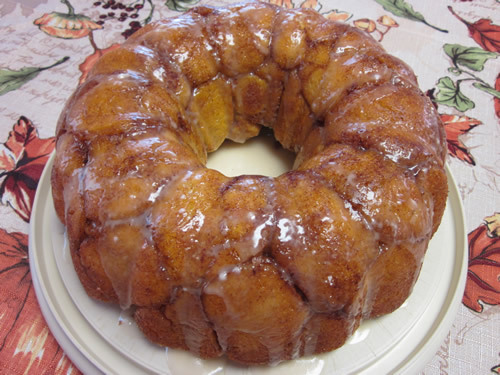 In addition to making some yummy apple cider donuts today while at my mom's house, I also tried this recipe for pumpkin monkey bread. 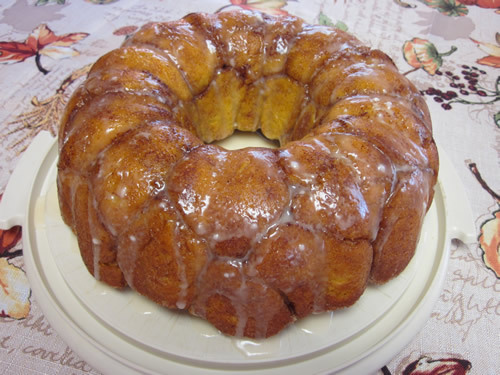 I love regular monkey bread, but I hardly ever make it because it's so not good for you. But, I couldn't resist the temptation to make this new twist on the original while I was on my fall baking spree. It turned out great! It has a very mild pumpkin and spice flavor, and still has the cinnamon sugar gooey goodness that I love in regular monkey bread. 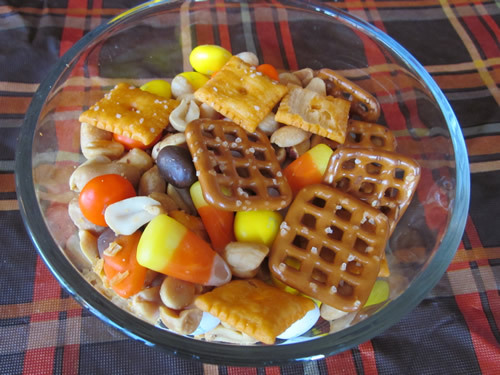 If you have some extra pumpkin and some extra time, give this one try. In a large bowl, whisk together the flour, salt, and spices. In another large bowl, whisk together the milk, water, pumpkin, melted butter, sugar, and yeast. Make a well in the center of the flour mixture and add in the wet ingredients. Using a wooden spoon, gently stir until the dough comes together. Turn out on to a lightly floured surface and knead until smooth and elastic, about 10 minutes. (I combined the ingredients in my Kitchen Aid Mixer using the dough hook, and just kneaded it slightly). Spray a clean bowl with cooking spray and place the dough inside. In the meantime, mix together the cinnamon and sugar, and melt the butter for the coating. Spray a bundt pan with cooking spray. Once the dough has risen, shape the ball into a large rectangle. Using a sharp knife, cut the dough into roughly equal-sized pieces and roll each piece into a ball (about 40 pieces). Dip each ball of dough into the melted butter and then the cinnamon-sugar mixture, layering them in the bundt pan as you go. Preheat the oven to 350 degrees. Bake the bread until golden brown, 30-35 minutes. Let cool for 5-10 minutes before turning out on to a platter. To make the glaze, stir together the powdered sugar, maple syrup, and cider. Pour over the bread while it’s still warm. I spent the weekend with my mom, and it was a perfect fall weekend. Fall always makes me want to bake, especially things that make your house smell like fall. Basically, that means anything with cinnamon. 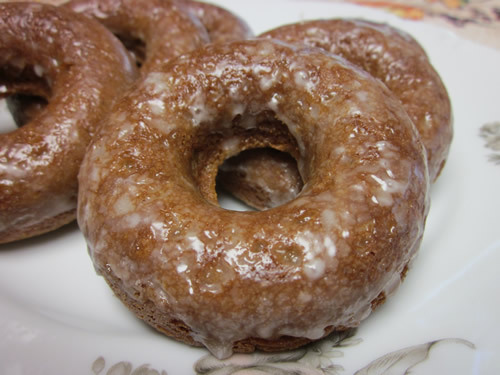 :) So, this morning I finally broke in my new Wilton donut pans and made some delicious apple cider donuts. I don't usually eat donuts because fried foods don't get along with my stomach. But these yummy baked donuts were the perfect solution. Give them a try. Your family will love you for it. In a large bowl, whisk together the egg, brown sugar, apple butter, syrup, cider, and sour cream. Fold the dry ingredients into wet ingredients, blending just until combined. Pour batter into a gallon ziplock bag. Cut off one corner to use like a pastry bag. Pipe the batter into the donut pan cavities, about 2/3 full. Bake in preheated oven about 10 minutes (mine took a little less). While the donuts are baking, mix up the glaze. In a shallow bowl that is large enough to dip the donuts in later, combine the powdered sugar and apple cider until smooth. It is a glaze, so it will be thin. When the donuts are cooked, flip out onto a cooling rack. Dip warm donuts into glaze and let them cool on cooling rack until glaze sets. Serve with hot apple cider or hot chocolate for dunking. Yum! 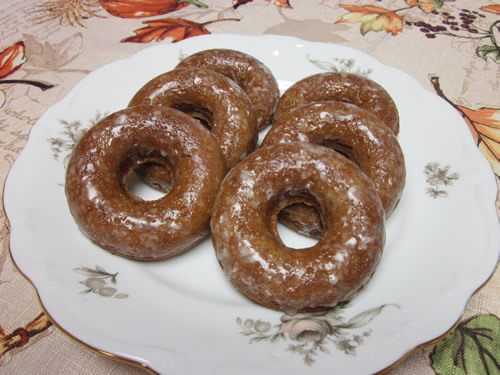 This recipe made 12 regular donuts and 12 mini donuts using my Wilton donut pans.